Why under “support groups?” Because communities of homeschoolers spring up around these camps! Not always held in the summer, many take advantage of lovely spring or fall weather and uncrowded camping areas. Many homeschool associations and support groups also hold camps for members. 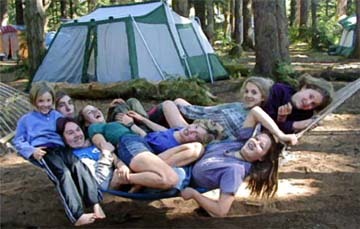 California teens shortly before the hammock broke. Family campout at Patrick’s Point with HSC. Christian camp. Horseback riding and typical camp activities. Maple Ridge, British Columbia, Canada. Week-long open enrollment programs for homeschooled children ages 9-17 in Fairlee, Vermont. A vibrant community has grown out of NBTSC. We’re a passionate, feisty, caring, indignant, compassionate group of people, with more variety of opinions than anybody can quite handle all the time. Facebook Open Group: A group for all NBTSCers, new and old, current and former, staff and camper, one-year and ten-year. Our courses are specifically designed to meet the unique needs of homeschool families. Trackers programs are conducted almost entirely outdoors, fostering active engagement with the lessons and the land. For some specific projects in Berkeley, we may also utilize our historic Trackers Guild Hall for fine craftwork projects and more. The Homeschool Outdoor Adventure Program (HOAP) offers wilderness and folk craft taught by the best educators at Trackers. Youth and teens can connect while learning new skills through our Mentoring Days, Skills Evenings and Open Archery Range. We have an optional potluck every evening, sing-a-longs, hikes, board or card games and lots of impromptu action. If you have a craft or activity you enjoy and would like to share, please do! Home School Family Camp was created specifically for Christian homeschool families who are looking for a fun learning experience to complement their families’ studies. Colcord, Oklahoma.